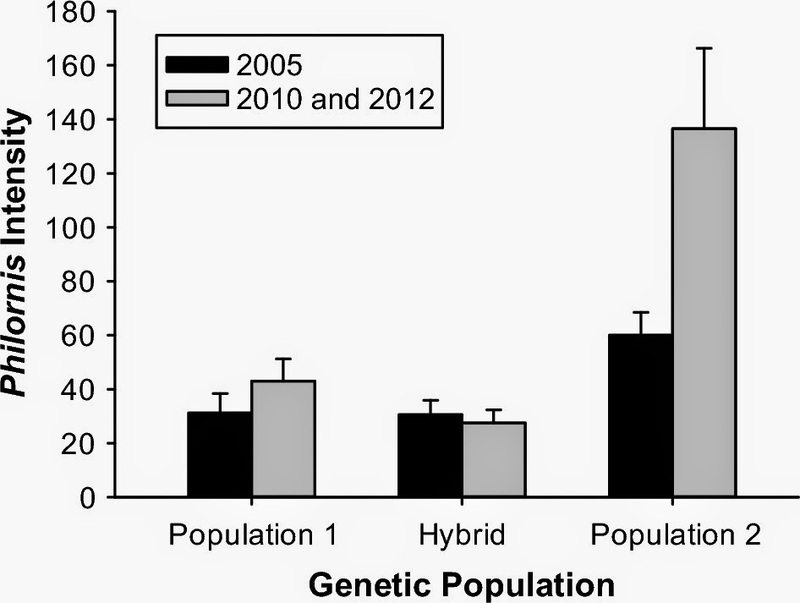 Species Collapse via Hybridization in Darwin's Tree Finches. Am Nat. 2014 Mar;183(3):325-41. doi: 10.1086/674899. Abstract Species hybridization can lead to fitness costs, species collapse, and novel evolutionary trajectories in changing environments. Hybridization is predicted to be more common when environmental conditions change rapidly. Here, we test patterns of hybridization in three sympatric tree finch species (small tree finch Camarhynchus parvulus, medium tree finch Camarhynchus pauper, and large tree finch: Camarhynchus psittacula) that are currently recognized on Floreana Island, Galápagos Archipelago. Genetic analysis of microsatellite data from contemporary samples showed two genetic populations and one hybrid cluster in both 2005 and 2010; hybrid individuals were derived from genetic population 1 (small morph) and genetic population 2 (large morph). Females of the large and rare species were more likely to pair with males of the small common species. Finch populations differed in morphology in 1852-1906 compared with 2005/2010. 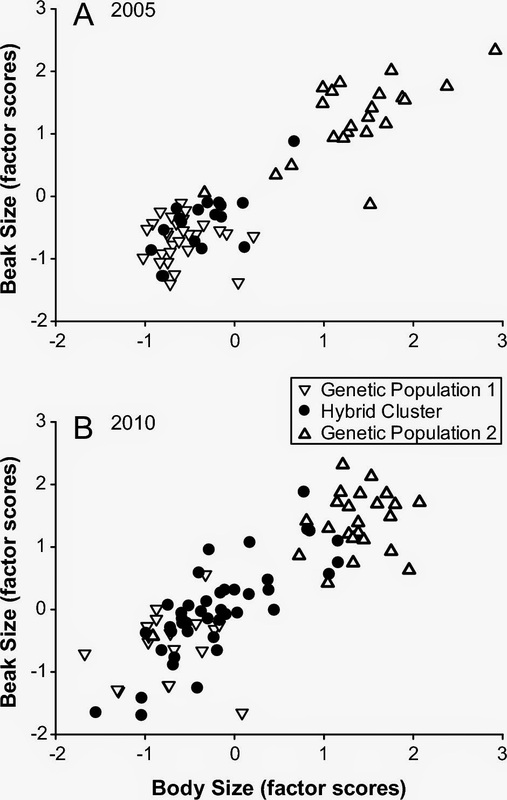 An unsupervised clustering method showed (a) support for three morphological clusters in the historical tree finch sample (1852-1906), which is consistent with current species recognition; (b) support for two or three morphological clusters in 2005 with some (19%) hybridization; and (c) support for just two morphological clusters in 2010 with frequent (41%) hybridization. We discuss these findings in relation to species demarcations of Camarhynchus tree finches on Floreana Island. Figure A1. Images of three sympatric tree finches from Floreana Island in 2010 that were retrospectively assigned to the following populations: A, genetic population 1 (∼2-year-old male); B, hybrid tree finch (∼4-year-old male); and C, genetic population 2 (yearling male). At the time of measurement in the field, the birds were categorized as small (A), intermediate (B), or large (C) tree finches. (5) parasite intensity varies with finch body size, with larger-bodied finches having higher P. downsi intensity. (3) To determine whether the large tree finch has become extinct on Floreana Island through a process of reverse evolution. Statistical analysis of body and beak size indicated the existence of 3 groups of finches moving to just 2 over the 100 year time frame as shown in Figure 2 below. Figure 2. Morphological clusters identified by MCLUST. Shown are morphological data (males only) analyzed by D. Lack (N = 171, 1888–1906; A), Kleindorfer and O’Connor (N = 76, 2005; B), and Kleindorfer and O’Connor (N = 83, 2010; C). The small-bodied finches are represented by filled circles, intermediate-sized finches by crosses, and large-bodied finches by filled triangles. Component means are marked by an asterisk at the center of each ellipse, and ellipses with axes indicate covariances. Wing length (mm) and principal components scores for derived beak size were used as input variables for A. Principal components scores for derived beak size and body size were entered as input variable in B, C. This method identified three morphological clusters in historical data (A) and either two or three clusters in contemporary data, depending on the year sampled (B, C). Following micro-satellite analysis the putative population clusters were; 'genetic population 1': containing the majority of individuals from putative small tree finch (Camarhynchus parvulus) from 2005 and 2010; and 'genetic population 2': containing the majority of individuals from putative medium tree finch (Camarhynchus pauper) from 2005 and putative large tree finch (Camarhynchus psittacula) from 2005 and 2010, while the majority of individuals from putative Camarhynchus pauper from 2010 showed intermediate membership. Figure 3. The relationship between body size (principal components factor scores) and beak size (principal components factor scores) for individual tree finches on Floreana Island shown in relation to genetic population for (A) 2005 (low-rainfall year; N = 76 males) and (B) 2010 (high-rainfall year; N = 83 males). Measurements of parasite load in the different genetic populations showed further evidence for the current two distinct populations of finches. Figure 6. Mean parasite intensity (mean ± SE) from Philornis downsi larvae per Darwin’s tree finch nest on Floreana Island. The data are shown for nests that have been assigned to a genetic population. On average, genetic population 1 (N = 18) corresponds to small-bodied tree finches, hybrid cluster (N = 17) to intermediate size, and genetic population 2 (N = 8) to larger-bodied tree finches. For this analysis, data were analyzed for 2005 (low-rainfall year), and 2010 and 2012 (high-rainfall years). The authors present evidence that three sympatric species of Darwin’s tree finches in the 1900s have collapsed, under conditions of hybridization, into two species by the 2000s, and for the suspected extinction of the large tree finch (C. psittacula) on Floreana Island.